I didn’t have the heart to post my Friday Finishes when everything was the same as my WIP and all I’ve accomplished since Wednesday is this slipper pincushion. 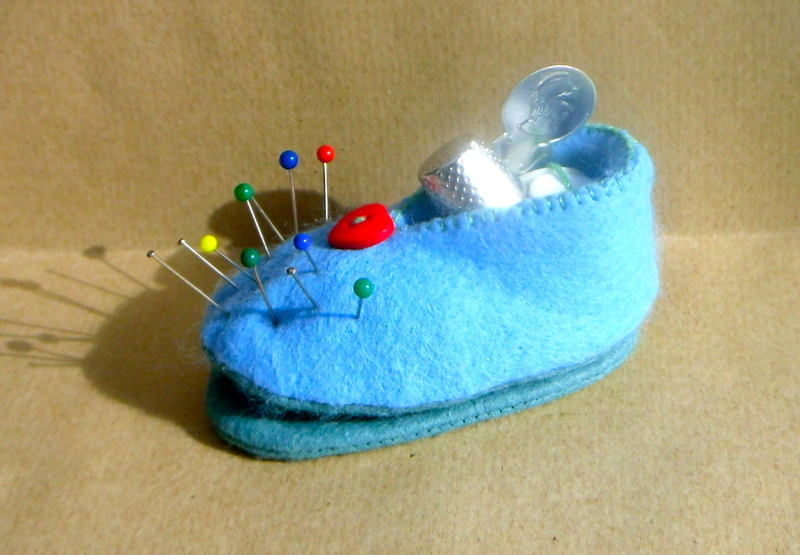 One of my Bee friends loves shoes and I had the idea of making a shoe pincushion with a needle case hidden in the sole. I came across Heather Bailey’s Bitty Bootee pattern, which really is super cute, and I had big plans to make lots of these for everyone in brightly coloured felt with embroidered flowers and so on. So I started this one as a test run and it all came together ok, although there are a few things I’d do differently next time, but somehow I liked the idea better than the finished item and I just feel like it’s all fallen a bit flat. So I’m wondering a) whether this one looks all right to send or b) whether I should embellish it more or remake it in less drab colours or c) whether I should just make her something different. So adorable! She will love it, Janine! And from the first commenter, yes I'd buy one too! In fact at least 4!!!!!! Janine, it's seriously gorgeous! I am sure she will love it! 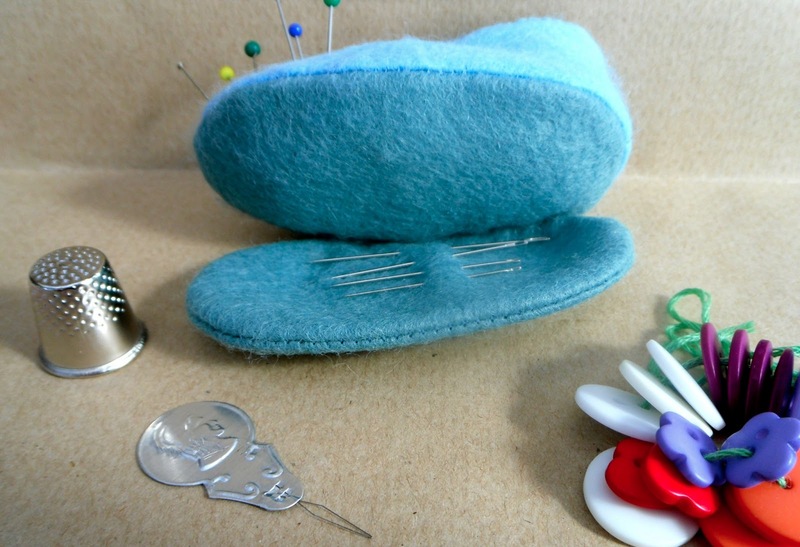 Your pincushion is seriously adorable! Really! Aw,Janine! You need to see it from out point of view and then you would be happy with it! I think it is just perfect, and anyone would be thrilled to receive it. It's cute – send it! I know what it's like when you lose the willingness to sew. Take a breather Janine and it will soon be back :) BTW, mine's on overdrive at the moment – is there ever a happy medium? It is just darling! 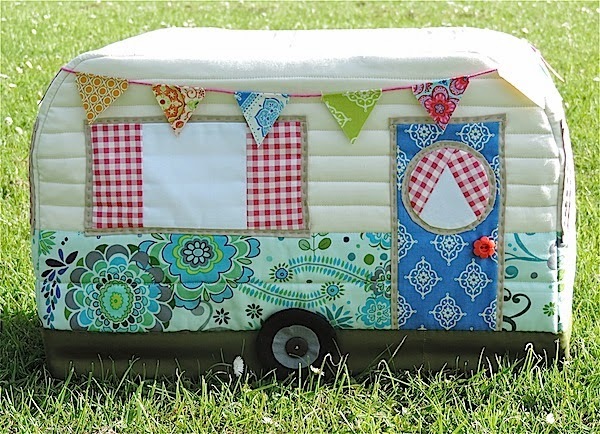 Perhaps you just need a break from quilting. I am sorry you think it looks a bit flat- I like it! 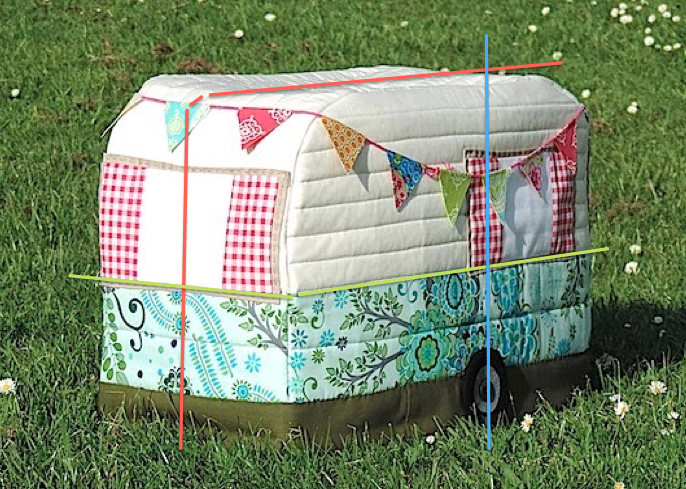 It is so cute, and would be just dandy sitting on the arm of the chair while you do a wee bit of hand sewing! And that blue is soo pretty! It is lovely- I suspect you are just feeling flat today- the wee shoe is dotey! First thought: That little shoe is SOOOO cute!! 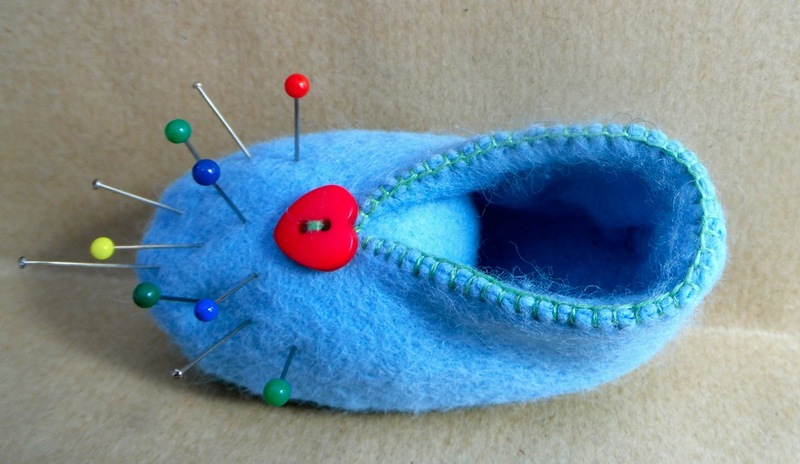 Second thought: It's a pincushion, too, SOOOO clever!!! Third Thought: Look at that lovely heart button!!! Fourth thought: Would that be made for sale? Last thought: WHAT?! Doesn't she like it?? ?